The original Winnie the Pooh books by A. A. Milne end with Christopher Robin telling his friends that he won’t be coming to the Hundred Acre Wood anymore because he’s starting school. This collection of stories by David Benedictus imagines what it would be like when Christopher Robin returns from school to spend summer holidays with Pooh and the whole gang. Winnie-the-Pooh (1926), Now We Are Six (1927), and The House at Pooh Corner (1928) must be among the sweetest, funniest, warmest stories for children. I don’t know, to be frank, what exactly makes them so; I think it must be a combination of wit, simplicity, and pure heart. They are such wonderful books, in fact, that I cannot imagine an author attempting to continue the story without fearing that they will diminish the originals. My family and I listened to the audio version of Return and it was the most surprisingly happy experience I’ve had in a long time. We know the Hundred Acre Wood friends very well; we’ve read the books again and again, watched the Disney movie versions with glee, and I, for one, didn’t think the world wanted nor needed further adventures with Pooh. I was happily wrong! A. 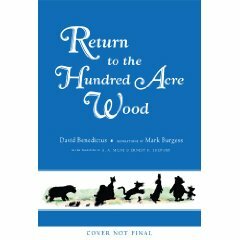 A. Milne must have been smiling down on David Benedictus as he was re-imagining this enchanted world because Benedictus’s stories have the same heart, warmth, simplicity, and humor as the originals. 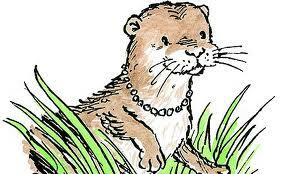 There is even a new character, Lottie the Otter, who fits right in and is a wonderful addition to the family. We loved listening to this book and now we are going to buy the hardcover illustrated copy that we will place next to Milne’s versions, right where it belongs. I recommend this book to be read aloud to kids age 3 to 8. If you loved the original stories, you will not be disappointed with this fantastic sequel.